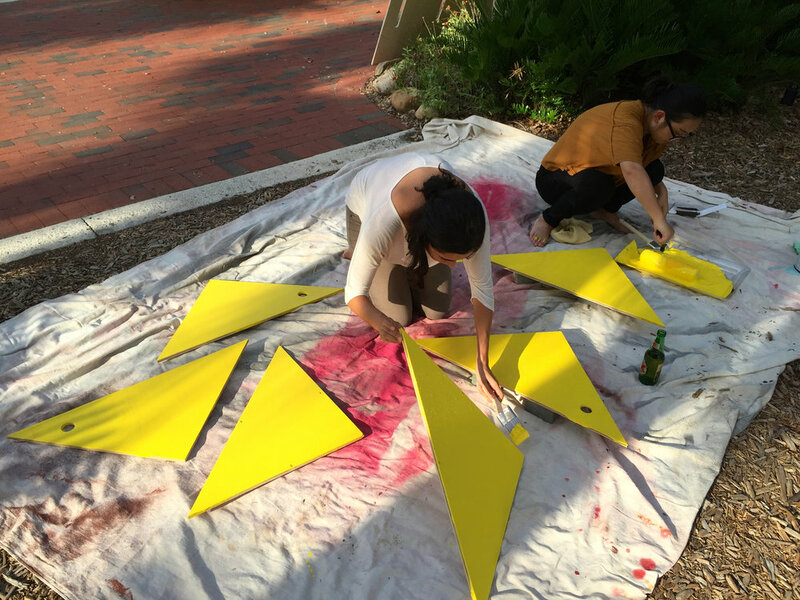 College Park >> one of Orlando’s most eclectic and well-defined neighborhoods, was the hosting center for this year’s PARK(ing) Day - an event where citizens, artists and activists collaborate to temporarily transform parking spaces into usable park spaces. 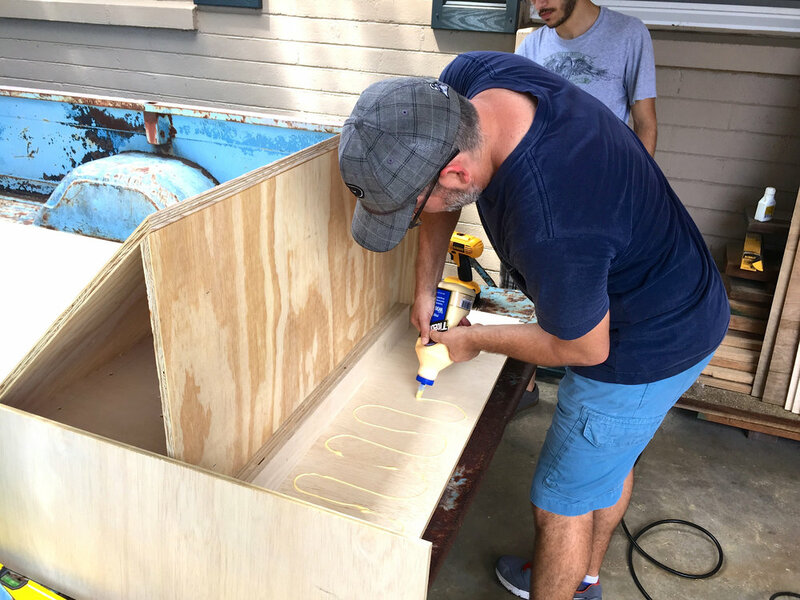 This event is one device of tactical urbanism which uses short term, low cost installations intended to show how permanent applications could improve our communities and neighborhoods. 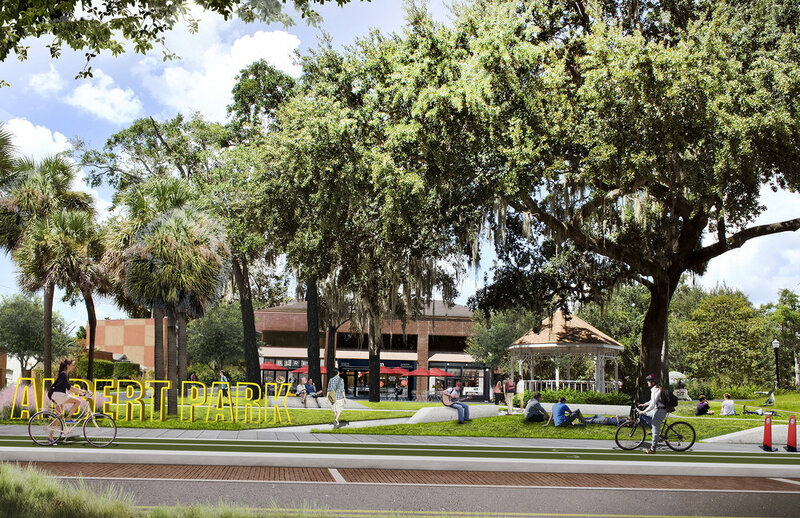 Focusing on a bigger picture idea, we wanted to portray an implementable concept that would serve to improve Edgewater Drive, utilizing complete street initiatives, and its centerpiece space, Albert Park. 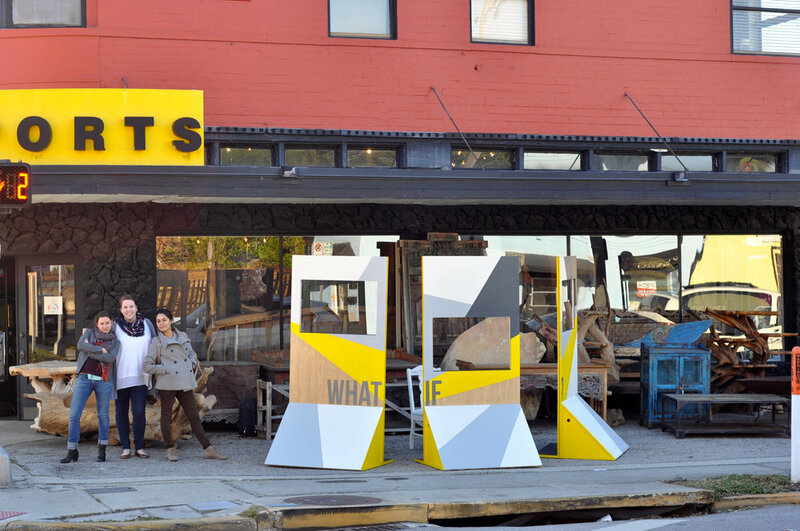 As part of the first installation of our WHAT IF series, we portrayed this vision in an installation called “Stand, Sit, Stand” which framed existing conditions while providing opportunity to show the possibilities. We acknowledge the successes of the Edgewater Vision Plan adopted in 2009 but wanted to explore ideas that could go beyond the plan in order to create an authentically vibrant main street environment true to College Park. Albert Park had more interaction with its surroundings? Albert Park had more flexible spaces? Edgewater Drive was more walkable? You could live, work, and play here? ...Albert Park had more interaction with its surroundings? The park, being more engaging of the adjacent streets, allows for a flow of movements and uses. The edges between the park and the adjacent sidewalks begin to blur. 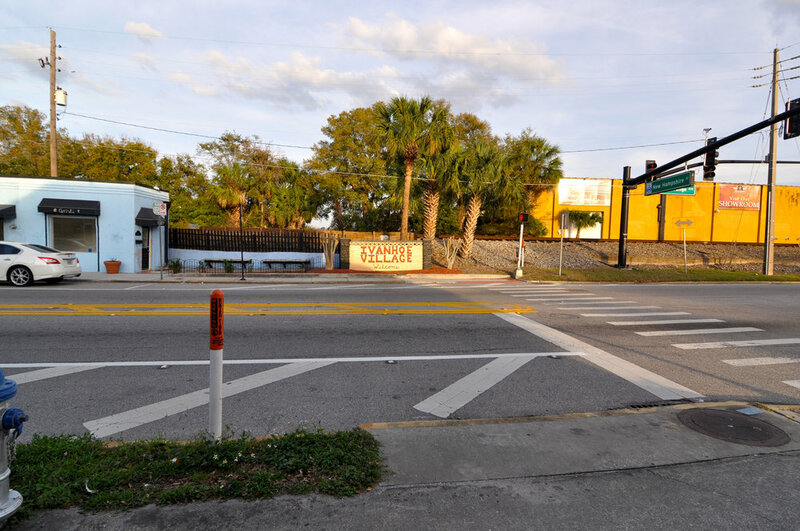 The intersection of Edgewater and Vassar could be elevated to create a flush street condition which supplies a venue for street festivals while providing traffic calming and slower speeds. This space can become a place where pedestrians, bicyclists and cars share the space alike. 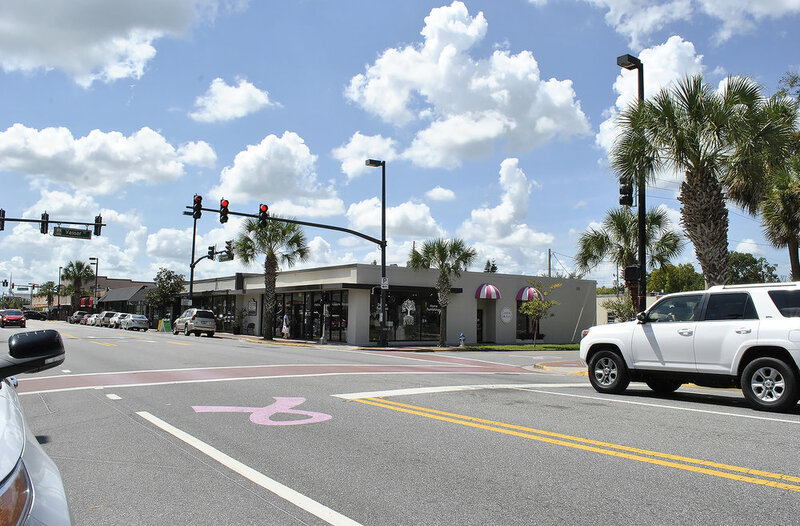 A critical component of the creation of complete streets is providing accessibility for all. While bike lanes serve as great connections for moderate to experienced cyclists, separated bicycle systems provide a safe, usable and practical route for people of all ages and abilities. ...Albert Park had more flexible spaces? Parks with flexible open space provide opportunities for a diversity of functions and users, as well as creating a transparent, safe and welcoming environment. Edges in the form of shopping and dining would add another layer of activity and use to the park. Artful elements could be multi-functional, serving as signage, seating, interactive play and visual attractions. ...Edgewater Drive was more walkable? 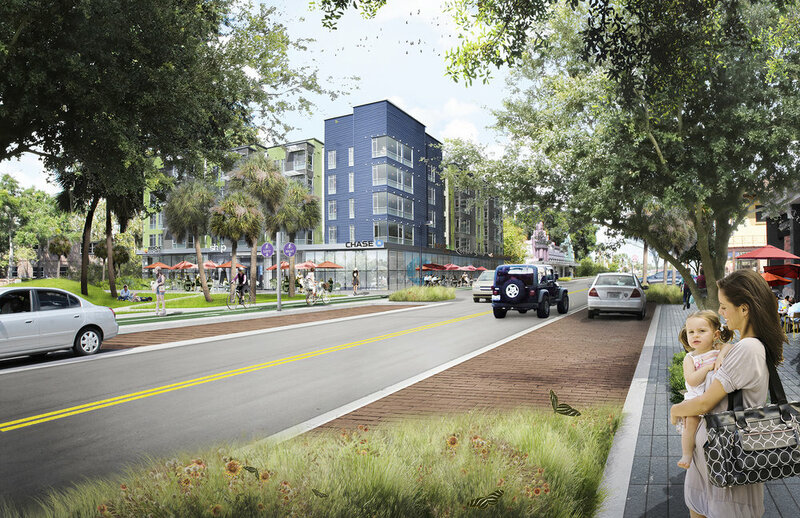 By narrowing Edgewater Drive, we provide opportunity for street trees (shade), wider sidewalks, and dining zones. We allow more space for people on foot and bike to shop, dine and support our local businesses. ...You could live, work and play here? We all want to have more places to dine, shop, and socialize. Serving to activate the park and support retail along Edgewater Drive, mixed-use, infill development would bring people and commerce to the neighborhood. How would it work in College Park? The images illustrate some of the possibilities, and we took it a step beyond to examine the functionality of the concepts. In the past, Edgewater Drive has changed from 4 lanes to 3 lanes reducing its total collisions by 40%, injuries fell by 71%, bicycle counts increased by 30% and pedestrians on sidewalks increased by 23%2. 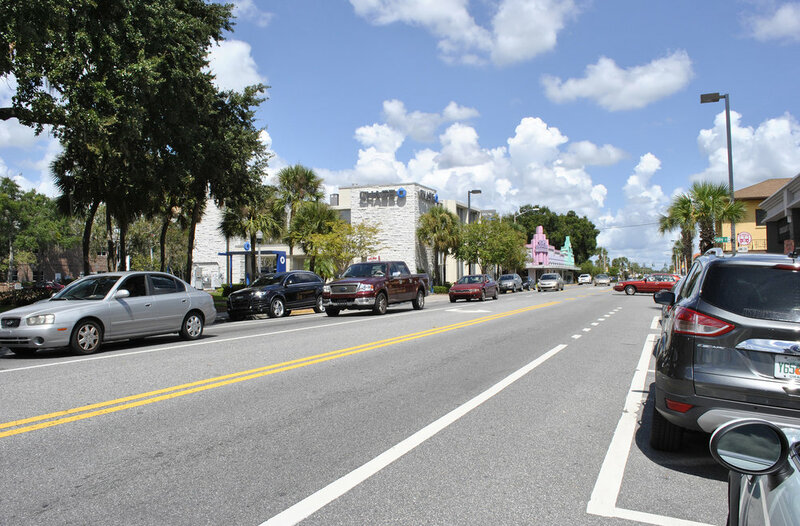 If all modes of transportation were given equal importance, Edgewater Drive could be even further improved and could become a true point of destination. The street could be narrowed allowing for wider sidewalks and slower speeds, while bike lanes could be consolidated to create a separated bike trail. The bike trail would become a great asset for College Park and the surrounding neighborhoods as it could connect to the Orlando Urban Trail and Gaston Edwards Trail. Over the course of 7 days, our team designed, fabricated, and painted the “Stand, Sit, Stand” installation. It is designed as a mobile, temporary installation that is easily assembled and broken down for transport. Being strategic in our parking space selection, we at Dix.Hite saw a need in the Albert Park area and responded with “Stand, Sit, Stand,” portraying three before and after illustrations highlighting critical elements of great street and park spaces. Our goal was to provide big idea solutions in order to generate conversation with the College Park community. In doing so, we were able to speak to hundreds of people of all ages, genders and ethnicities throughout the day. Many questions were asked and further ideas expressed. As the takeaway from the installation, we gathered community input on a reclaimed, painted chair. For a more in-depth look at our process DOWNLOAD our vision book here.